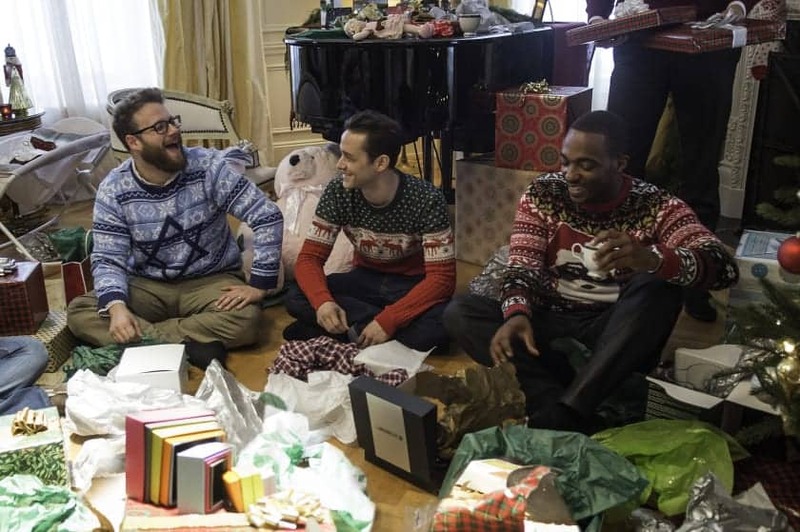 Seth Rogan’s Christmas comedy the night before runs on a very defined “if it ain’t broke, don’t fix it” rule. This adult x-mas yarn has Rogan playing side kick (along with Anthony Mackie) to Joseph Gorden-Levitt’s Ethan, whose quest to find and enjoy New York’s dopest secret festive party, plays off very much in the way that you would expect it to. With varying results. There isn’t that much to expect and little to say about this comedy. It’s sometimes laugh out loud funny. It often misfires. Much of this comes from the approach of the material. The idea of setting up jokes well is as laid back as the trios views on recreational drugs. It is funny to have Micheal Shannon’s shady drug lord, joke about his quiet intensity. It is, however an easy joke. Much like the meta-joke of Rogan’s Issac badmouthing Iphones with the knowledge of Rogan appearing in Steve Jobs (2015). This and cameos are really what The Night Before is made of. There is a mealy mouthed plot about friendship at the festive season, but much like having one too many on a boozed-fuelled night out, you may only remember the awkwardness afterwards. Jonathan Levine’s interesting and varied directional career has oddly landed him in stoner comedy territory. Like David Gordon Green (see Your Highness) one or two people may be wondering why. The slack jawed bagginess of The Night Before just isn’t the same as the summer hued laziness that pervades his underrated coming of age flick; The Wackness (2008). We do get an overuse of wide angles and lens distortion in tight places, plenty of dated 80’s references (Die Hard, Big, et all) and obvious nods to Christmas stories (It’s a Wonderful life, The Grinch, Home Alone). None of it is as well placed as Levine’s use of 90’s hip hop nostalgia that layered his coming of age drama. This said, the love of hip hop remains as strong here and having Pete Rock and C.L Smooth on a soundtrack is is no bad thing in the eyes of this writer. The bagginess and the scattershot aspects quickly become quite tiring. Yes, there’s drug taking, and there’s one or two big laughs. The likes of Antony Mackie in a comedic role shows that the man has more range than he’s often given. However, its lazy message of friends being the new family would have been more interesting if the creators gave a damn about giving everything a bit more structure over comedy cameos. There’s about 3 episodes of How I Met Your Mother which not only feel similar to this, but funnier, smarter and with stronger repeat value.